Male-male reproductive competition occurs in many animal societies and can be costly, both through aggression or energy expenditure prior to mating and lost paternity. 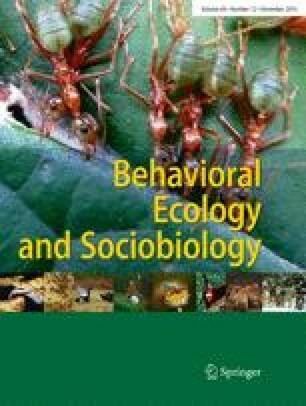 In most cooperative breeders, socially dominant males breed more often than do subordinates, but the costs of pre-copulatory subordinate male reproductive competition (including unsuccessful competition) have rarely been investigated in these systems. Here, we examine the association between such competition and the fitness of dominant males in the cooperatively breeding southern pied babbler (Turdoides bicolor). Babbler groups comprise a dominant breeding pair with adult subordinates of both sexes. Roughly 35 % of adult subordinate males live in groups with unrelated adult females, but despite their common engagement in active reproductive competition, these subordinate males rarely successfully breed (extra-group mating has never been detected). Overall, active reproductive competition with subordinate males is not costly to dominant males, notwithstanding that rare episodes of breeding by subordinate males cause large paternity losses (50–100 %). Specifically, the presence of an actively competing subordinate male does not affect the proportion of successful nests, the number of fledglings fathered by the dominant male or dominant male retention of dominance to the next breeding season. Instead, dominant male breeding success is likely to be more affected by factors such as food availability and group size. In the social context of cooperative breeding, a competing subordinate male may provide benefits of a larger group size or increased help; these may offset the low risk of paternity loss, possibly promoting tolerance of reproductive competitors by dominant males. The online version of this article (doi: 10.1007/s00265-015-2011-0) contains supplementary material, which is available to authorized users. We thank T. Clutton-Brock and the staff at the Kuruman River Reserve for support for the Pied Babbler Research Project. The Kotzes and the de Bruins allowed land access. M. Bell, K. Bradley, S. Engesser, F. Finch, T.P. Flower, K. Golabek, D. Humphries, A. Radford, N. Raihani, R. Rose, A. Thompson, J. Westrip, E. Wiley and assistants helped with collecting data and maintaining habituation of babbler groups. Statistical help was provided by S. English, R. Mares and A. W. Bateman. Helpful discussion and comments were provided by S. English, T. P. Flower and R. Mares, and two anonymous reviewers. Grateful thanks to T.P. Flower for logistical support. Financial support was provided by the DST-NRF Centre of Excellence at the Percy FitzPatrick Institute for African Ornithology at the University of Cape Town to MJN-F and ARR and by the National Science and Engineering Council of Canada to MJNF. All applicable international, national and/or institutional guidelines for the care and use of animals were followed. All procedures performed in studies involving animals were in accordance with the ethical standards of the University of Cape Town. The Northern Cape Conservation Authority permitted research on pied babblers, and fieldwork received ethical clearance from the University of Cape Town’s Animal Ethics Committee (AEC no. 2006/V15/AR).